The 918 Spyder, presented at the Geneva show in March, has attracted at least 2,000 non-binding submissions of interest, people familiar with the matter said. (Bloomberg) -- Porsche AG's supervisory board approved production of the 918 Spyder plug-in hybrid sports car, a model that accelerates to 100kph in 3.2 seconds and may top the Carrera GT as the manufacturer's costliest vehicle. Porsche plans to develop the vehicle at its Weissach research facility near Stuttgart, where the carmaker is based, the company said. The car will be built at the main plant in Zuffenhausen, which is also near Stuttgart. "This is also a very important commitment to Germany as a manufacturing base,” Porsche CEO Michael Macht said in a statement. He said the mid-engine 918 Spyder will be built in a limited series. The 918 Spyder was one of three hybrid models Porsche presented at the Geneva auto show in March. It has attracted at least 2,000 non-binding submissions of interest, people familiar with the matter said. Porsche needed at least 1,000 sales pledges to sign off on building the car, development chief Wolfgang Duerheimer said in April. The 918 Spyder shown in Geneva promised CO2 emissions of just 70 grams per kilometer, corresponding to fuel consumption of 79 U.S. mpg (3.0 liters of fuel per 100km). The supercar may be priced at about 500,000 euros ($650,000), topping the 453,000-euro Carrera GT of which no more than 1,500 units were produced. 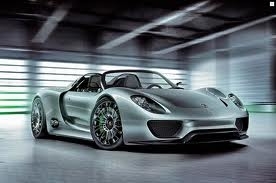 The 918 Spyder may be introduced as early as 2013, according to Tim Schuldt, an analyst at Equinet AG in Frankfurt. The two-seat car accelerates to a top speed of 320kph (199 mph), relying on a 500-hp V-8 engine and electric- drive systems that allow the vehicle to run up to 25km on electric power. Porsche agreed with worker representations last week on measures to preserve jobs and improve productivity through 2015. The accord includes a pledge to build the 918 Spyder if the car draws sufficient interest, people familiar with the matter said. Porsche plans to add models with a goal of doubling annual sales to as many as 150,000 vehicles over the medium term, and benefit from savings from a planned merger with Volkswagen AG.